The other good-for-me routine I've been working on this month is skincare! The best addition to my skincare lineup has to be Kiehl's Precision Lifting & Pore Tightening Concentrate. The name really says it all - the serum concentrate is designed to lift, firm, and reduce pores. As for packaging, I'll be the first to admit that the dark brown bottle lacks a bit of pizzazz. That said, I've long since learned not to judge a bottle by its cover! I'm on my second bottle of Kiehl's Powerful Strength Line-Reducing Concentrate, which shares a similar lengthy moniker and nondescript packaging (it's almost like they want the good stuff to go incognito). Kiehl's Precision Lifting & Pore Tightening Concentrate contains a blend of micro-filtered yeast extract and geranium essential oil for efficacy. I was pretty excited about the yeast extract (as bizarre as that might sound), as I'm hoping it can provide results a la famed ferment in SK-II. The texture is consistent with previous Kiehl's concentrates; it's slightly thicker than lotion and I find it easier to pat on to the face. It's not a particularly slippery serum! Wearing Essie French Affair on my tips here! In terms of performance, the concentrate seems to be meshing well with my ingredient sensitive skin. I can't comment on the wrinkle/pore reducing capacities as they're not active issues for me. However, I can say, that my skin does seem healthy and well protected - a tall order in Chicago winters! (It's zero degrees outside, literally). I'll definitely be keeping up with Kiehl's Precision Lifting & Pore Tightening Concentrate, as I've had good results with the line thus far. We'll see what the yeast extract will deliver over time! 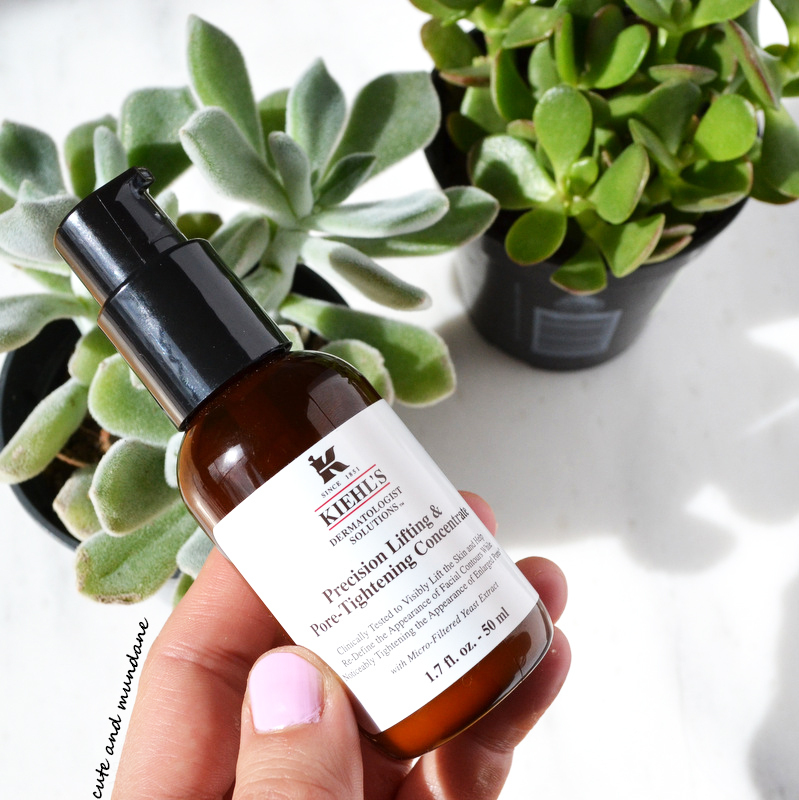 Overall, I've found Kiehl's Precision Lifting & Pore Tightening Concentrate ($64 for 1.7 oz) to be a lovely addition to the Kiehl's lineup, worth a moment of exploration next time you stop by a Kiehl's boutique or online at www.Kiehls.com. Thanks for reading! What are your Kiehl's favorites? Have you spotted the Kiehl's Precision Lifting & Pore Tightening Concentrate in stores? What are your thoughts on yeast extract? P.S. 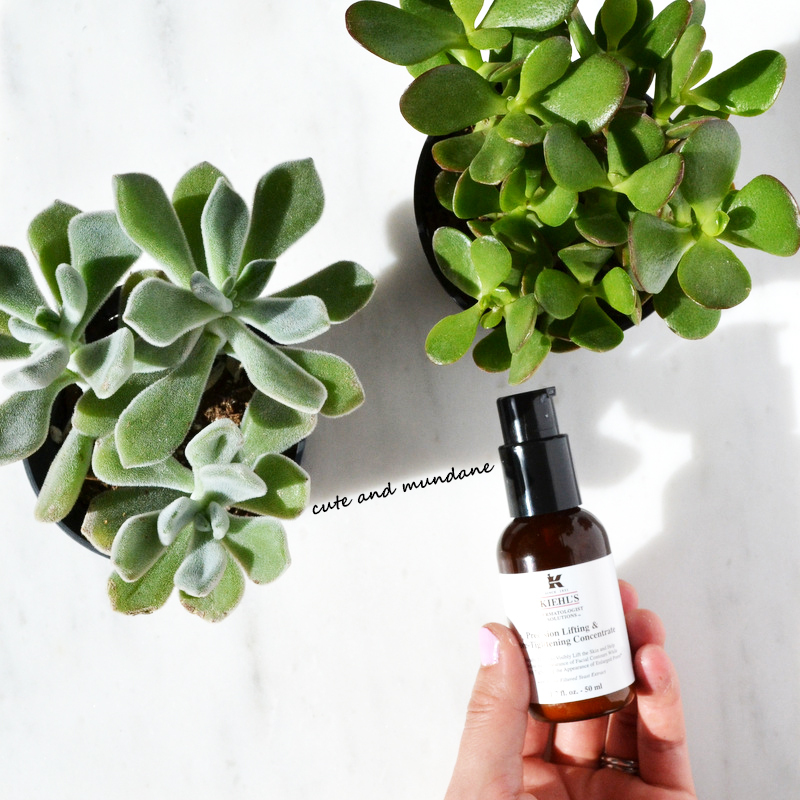 If you're looking to build a lifting/ firming routine from the Kiehl's lineup, check out my reviews of Kiehl's Midnight Recovery concentrate (which I adore), as well as the Kiehl's Super Multi-Corrective Eye-Opening Serum! Of course, I've been catching up on some much need skincare as well. Air travel and subzero temperatures call for extra care on this front! Today, I'm looking forward to sharing a few skincare favorites that I've been utilizing to this end, courtesy of EVE LOM! EVE LOM skincare products have received a lot of love as of late, so I couldn't wait to put these to the test! The products I'll be sharing today include the EVE LOM Cleanser, EVE LOM Rescue Mask, and EVE LOM Moisture Mask. 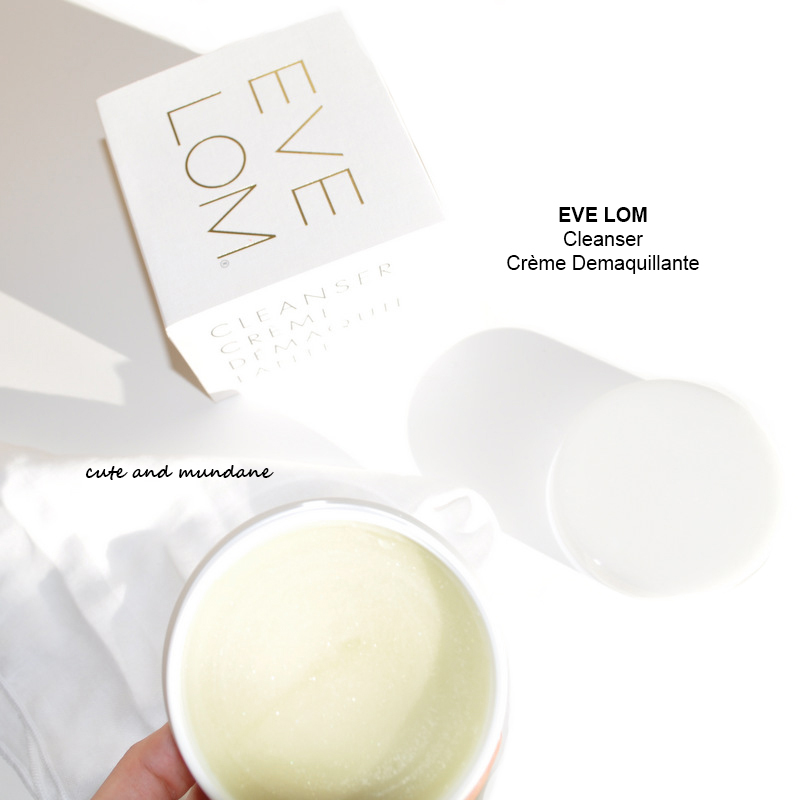 The EVE LOM Cleanser / Créme Demaquillante ($135 for 6.8 fl.oz.) is the iconic piece from the brand's lineup. The cleanser contains a blend of four aromatic oils with cleansing, decongesting, soothing properties. The cleanser itself look solid in the tub, but melts and picks up easily to touch. The scent is herbal / aromatic intermixed with paraffin. "Apply cleanser to the face using circular movements. Dip the muslin cloth in hot water and wring out. Press onto the face and hold for 5 seconds. Repeat 3 times. Rinse the cloth in warm water and remove all traces of make-up and cleanser making circular movements to exfoliate. Rinse cloth in cold water and re-apply to the face for 5 seconds to close the pores. Gently pat skin dry with a towel." The routine is absolutely lovely. The cleanser dissolves all traces of makeup and massages easily into skin. I loved the addition of the muslin cloths to the routine; the warm water soaks are oh-so-relaxing, while the clothes themselves were woven to have just the right amount of coarseness for gentle exfoliation. The extra steps are definitely worth the time; the warm soaks open pores and improve circulation. I'm definitely looking forward to incorporating the EVE LOM Cleanser into my everyday routine! EVE LOM Cleanser Ingredients: Paraffinum Liquidum (mineral oil), PEG-30 Lanolin, Cetearyl Alcohol, Bis-diglyceryl polyacyladipate-2, Aluminum stearate, Theobroma Cacao (Cocoa) Seed Butter, PEG-75 Lanolin, Phenoxyethanol, Eugenia Caryophyllus (clove) Leaf oil, Humulus Lupulus (Hops) oil, Chamomilla Recutita Imatricariaj Flower Oil, Eucalyptus Globulus Leaf Oil, BHT. "After cleansing, apply over the entire face, avoiding the area around the eyes. Leave on for between 15 and 20 minutes. Rub off gently with upward movements, then wipe skin clean with a damp buslin cloth." 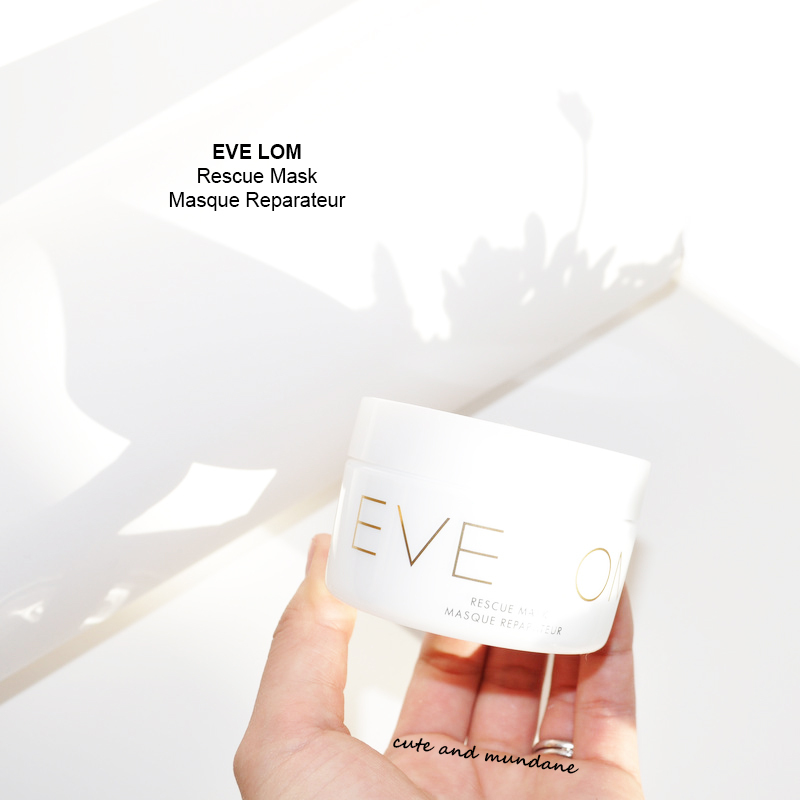 EVE LOM Rescue Mask Ingredients: Kaolin, Aqua (water), Glycerin, Alcohol denat., mel (honey), Prunus Amygdalus Dulcis (sweet almond) seed meal, phenoxyethanol, camphor, magnesium aluminum silicate, calcium chloride, Magnesium chloride, Sodium chloride, Ethylhexylglycerin, Aluminum Chlorohydrate, Allantoin. "For best results, use this leave-on mask in the evening after cleansing or whenever your skin needs extra hydration." In its glass tub, the EVE LOM Moisture Mask has the texture of a very viscous clear liquid. It reminds me of the texture of a slippery cleanser (but thicker). I only need the smallest touch of the moisture mask to spread over my face. It's effective at protecting and immediately hydrating; it's the kind of mask that will sit atop the face, as oppose to soaking completely into skin. The mask can be worn overnight (or if you're like me, while hanging out at home). I really like how this mask delivers an actual H2O 'moisture boost' as promised, as opposed to simply providing a coat of oils as a thick cream might. I was surprised at how much I enjoyed this one. EVE LOM Moisture Mask Ingredients: Aqua (water), glycerin, ceyclopentasiloxane, Dimethicone, Dimethicone/Vinyl Dimethicone Crosspolymer, Coconut alkanes, Glyceryl polyacrylate, Acrylates copolymer, PHenoxyethanol, Polyglyceryl-3-oleate, Propanediol, Coco-caprylate/Caprate, Tocopherol, Sodium PCA, Urea, Sodium hydroxide, Ethylhexylglycerin, Polymethylsilsequioxane, Sodium hyaluronate, Trehalose, Lecithin, Avena strigosa seed extract, Leuconostoc/Radish Root Ferment filtrate, Lonicera caprifolium (honeysuckle) flower extract, Polyquaternium-51, 1,2-Hexanediol, Phytic acid, Hydroxypropyl bispalmitamide mea, Lonicera japonica (Honeysuckle) flower extract, Potassium sorbate. 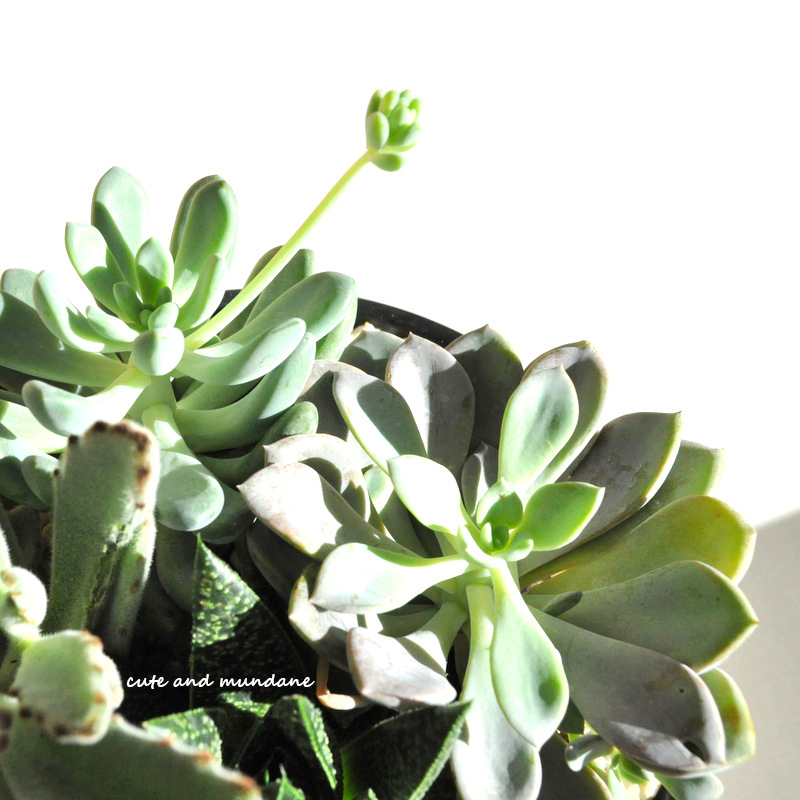 Overall, I've had a wonderful experience with my new EVE LOM skincare. The line has lovely minimalist packaging, and products that add a spa-like feel to my everyday routine. At the moment, my must-have of the three (and I'm sure many would agree) would be the EVE LOM cleanser. Both the product, as well as the routine are relaxing, yet effective. If you're a fan of cleansing oils, I have a feeling you'd really like this one. 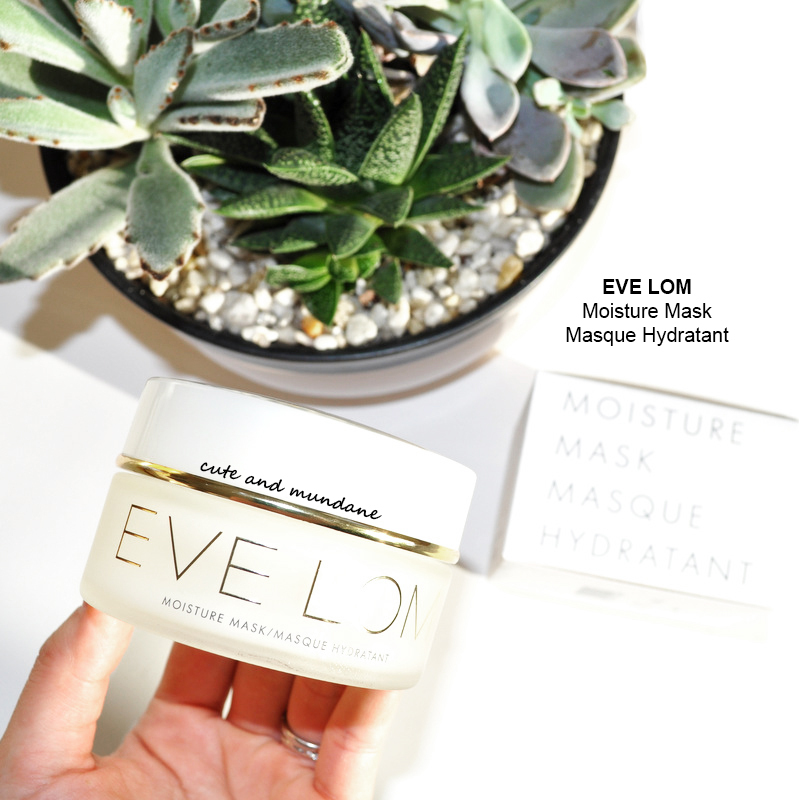 The EVE LOM Moisture Mask is the best mask fit to my sensitive, dry winter skin at the moment! Intense hydration is always welcome at this time of year! You can learn more or shop EVE LOM skincare and color at www.evelom.com, as well as Sephora and fine department stores. Thanks for reading! 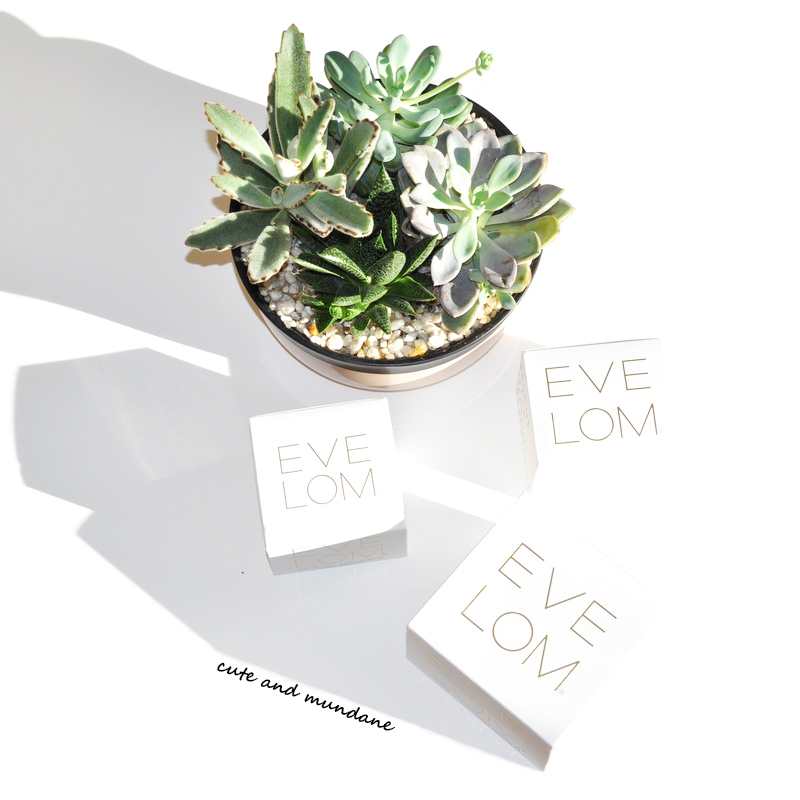 What EVE LOM products have you tried? Which ones are on your wishlist? What are you currently using for your winter skin?